What has happened to the cannon that was a World War One trophy and sat next to the clock in the Jubilee Gardens? It was buried on the corner of Victoria Square. It was seen on a train down Johnsonville way. It was buried in the town dump on the corner of Vogel and Taylor Streets. In 1933 the local Independent reported that the Borough Council were discussing whether or not the German 4 inch Howitzer should be removed. Some members were not happy with it sitting so close to the War Memorial. Cr W Moore opposed the removal saying that the trophy was one that had been captured from the enemy by British troops at the risk of their own lives. It possessed a sentimental value for all returned men. Perhaps it was a compromise but by September 1934 the Howitzer had been moved to the corner of Victoria Square. ‘Marmaduke’ wrote to the paper with his view that he didn’t want to look at the ‘hideous piece of machinery’ and hoped it would be disposed of for scrap iron. He was of the opinion that even if nothing was done with it, it would soon rust away. The cannon disappeared, probably about 1941, when the threat of the Japanese invasion was foremost. A resident remembers seeing the cannon being towed towards the dump. Another resident remembers seeing it partly buried in the Council’s gravel pit – near the dump. 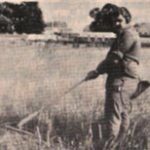 The Cambridge Historical Society sparked off a search for the cannon in the old gravel pit in February 1977 and the army was called in with a mine detector. They came up with an area which indicated a substantial metal object. And there the story lies.